I waited. I was hoping to be enlightened. R’ Moti Elon, who is likely to appeal charges against him, and for all anyone knows may not be found guilty, was condemned by Takana, a highly respected group of Modern Orthodox Rabbis and learned women. The court re-affirmed their findings. In a case like this, one must be careful. Elon does have rights, and one must write alleged. At the same time, there is absolutely no Chiyuv that I know of, which would make it necessary to invite him specifically to give a Torah lecture while this very real cloud hangs over Elon. 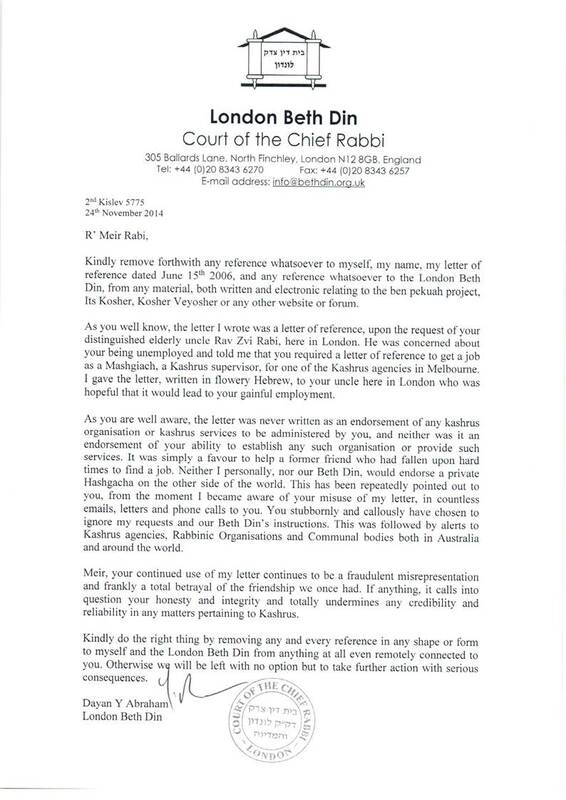 Rav Druckman had invited him, and whilst nobody can be anything but impressed by his achievements as a human being and as an educator par excellence, one must question his judgement in this case. I waited for an explanation, but either I’ve missed it, or there is none. Accordingly, I have suspended my faith in his judgement. It’s a pity we don’t have a body like Takana here in Melbourne. There are some dubious individuals, about which there is a raft of evidence that hasn’t yet seen the courts, circulating with clear ramifications that call for an enquiry. I see no need to INVITE such people to speak on topics given the very dark cloud that surrounds their past. Yes, they are innocent until proven guilty, but we can do better than choosing people who seem to be moral and upright and don’t have such clouds accompanying them. If and when they clear their name, בבקשה. “Let me tell you a true incident which for me is a metaphor of our times. A young man attended a yeshiva in Safed. “The next morning, the container was gone. “The next morning, that container, too, was missing. At the risk of sounding like an Orthodox basher, let me say that far too little is written about the lack of leadership on morality and ethics on the left side of our divide. I did notice criticism of Macabbi in the 2000’s for allegedly not doing enough to separate someone wth a grey cloud over their head, from Macabbi kids. In general, the left leadership is moribund except when it sees an Orthodox target. 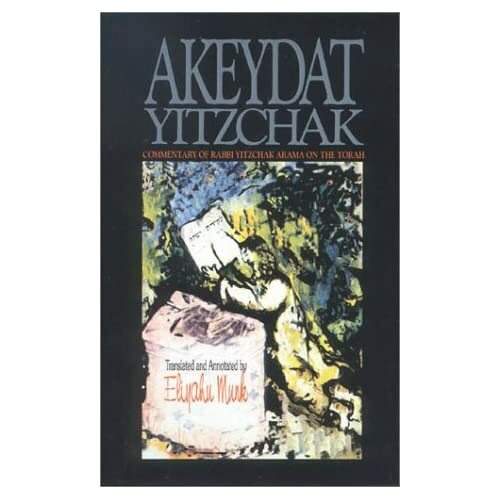 They includes the reform and the conservatives and the “unaligned” (Shira Chadasha, who for some reason market themselves as Orthodox but are not considered as such by 99% of the Orthodox community). Jews are a strange group. That’s why we have the crazy notion of people who want to “celebrate” Rosh Hashana and Yom Kippur without God. They advertised in the paper. I would imagine they sit around in Yoga type trances and moments of thought, and make “new year resolutions” while consuming apples dipped in honey. Ultimately, they are celebrating with God, for He ordained the concepts and their meaning. They just have a pintele yid, which is clouded by secularist, do good, and tikkun olam (the modern socialist mantra). They are good concepts in the main, but whether they like it or not, God is part of our tradition! Rosh Hashana isn’t “Happy New Year”. Why not run it on December 31st with the others? Isn’t that more inclusive and likely to break down the “barriers”. It’s actually God’s coronation. It’s not about making “commitments” per se, although one should use these times to improve. Other studies on the topic have been ambiguous. A 2009 study, led by Richard Lynn of the University of Ulster, compared religious beliefs and average national IQs of 137 countries. In their sample, only 23 countries had more than 20 percent atheists, which constituted, according to Lynn, “virtually all higher IQ countries.” The positive correlation between intelligence and atheism was a strong one, but the study came under criticism from Gordon Lynch of Birkbeck College, because it did not account for complex social, economical, and historical factors. The most common explanation is that intelligent people don’t like to accept any beliefs that are not subject to empirical tests or logical reasoning. Zuckerman writes in the review that intelligent people may think more analytically, which is “controlled, systematic, and slow”, as opposed to intuitively, which is “heuristic-based, mostly non-conscious, and fast.” That analytical thinking leads to lower religiosity. There are some complications to the explanations too. For example, the non-conformist theory of atheism cannot apply to societies where the majority are atheists, like Scandinavian countries. The possible explanations are also currently just that—possible. They need to be empirically studied. Nothing is to be achieved from the negative messages, prevalent in the hareidi/hassidic world about Israel. It is time for a change in approach so that new generations learn about what Israel is and not what it is not. Then the madim (uniform) and kelei ha’mikdash, the sanctified vessels and tools used daily to rebuild our Promised Land and safeguard all of its citizens, will be seen in a proper light..
Rav Aharon Lichtenstein, head of Har Etzion hesder yeshiva, related that once, when he returned to America and was visiting with his father in law, Rav Yosef Dov Soloveitchik, he posed a series of questions he had received from students serving in the IDF. One student worked in the tanks division and his job was cleaning out and maintaining the tanks. Often his uniform got covered in oil and grime and he wanted to know if he needed to change before afternoon prayer,davening Mincha, something that would be terribly inconvenient and difficult. The Rav looked at Rav Lichtenstein and wondered out loud, “why would he need to change? He is wearing bigdei kodesh, holy garments. These sacred garments have restored Jewish pride, faith and fortitude… these bigdei kodesh safeguard and secure all that is holy and worthwhile in G-d’s Promised Land and throughout the world. “A student of our Yeshiva approached me. I said to him: ‘At first I did not recognize you.’ He was wearing the army uniform. You know that I relate to this uniform in holiness. A lovely and precious man, full of G-d-fearing and holiness was approaching, and he was wearing an army uniform. At that occurrence I mentioned what I said at one wedding [of Ha-Rav She’ar Yashuv Cohen, chief rabbi of Haifa], when the groom came dressed in an army uniform. There were some who were pointing out that it is inappropriate for a groom to stand under the chuppah with an army uniform. In Yerushalayim, the Holy City, it was customary that they came with Shabbat clothing, holy clothing, like a streimel (fur hat worn by hassidim on the Sabbath, ed.). ” I will tell you the truth. 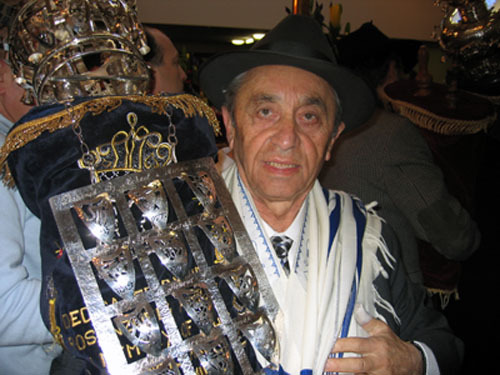 The holiness of the streimel – I do not know if it is one-hundred percent clear. It was made holy after the fact. Many righteous and holy Geonim (great rabbis) certainly wore it. There is certainly so much trembling of holiness before them, and we are dirt under the souls of their feet, and on account of this fact, the streimel was made holy. Thankfully, there are also those in the hareidi community willing to speak out against the angry and misguided radicalism that would diminish the glory of the IDF. Writing on Behadrey Hareidim,Rabbi David Bloch, founder of Nahal Hareidi, expressed his resentment at Rabbi Tzaurger’s words. The most basic Jewish value is that of expressing Hakarat ha’tov, gratitude, to anyone and everyone who does anything which is of benefit for me and certainly for society at large. Every Orthodoxy has radical elements. To be radical in one’s love of Torah and of God is not a sin. However, when one’s embrace of Torah is expressed as hatefulness towards IDF soldiers and a damning of the bigdei kodesh that they wear, then it is a radicalism that has lost sight of true Torah. In a letter published Monday night, the organization’s leaders, on behalf of more than 1,000 members, expressed their “encouragement and support” for the moderate chief rabbi candidate, while harshly criticizing Shas’ spiritual leader for lashing out at him during his weekly sermon on Saturday night. 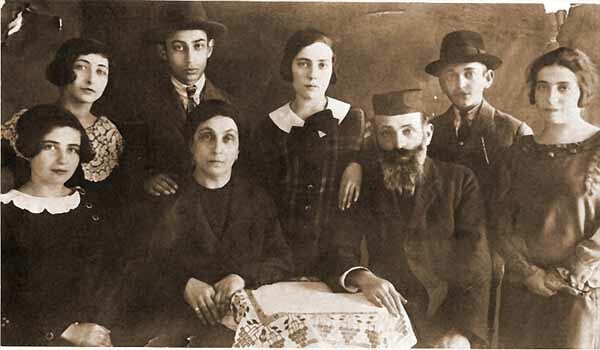 “We trembled upon hearing the terrible things Rabbi Ovadia Yosef said in regards to his honor,” RCA President Shmuel Goldin and Vice President Leonard Matanky wrote in Hebrew to Rabbi Stav, “and also when we heard of the events in Bnei Brak at the wedding of the daughter of Rabbi Rabinowitz,” referring to a verbal and physical assault on Stav by ultra-Orthodox teens Sunday evening. This is the most significant support Stav has received so far following the attacks against him, as the RCA is the largest organization of Orthodox rabbis in America. During his weekly sermon on Saturday night, Rabbi Yosef said that Stav, chairman of the national-religious rabbinical association Tzohar, was “an evil man” and that appointing him to the Chief Rabbinate was like bringing idolatry into the Temple. Prominent religious-Zionist Rabbi Chaim Druckman told Ynet that Rabbi Yosef had gone too far and that he was “extremely shocked by the blatant remarks” against Rabbi Stav. The battle against Rabbi Stav escalated on Sunday evening when he was attacked during the wedding of Western Wall Rabbi Shmuel Rabinowitz’s daughter. When he turned to leave the banquet hall they continued to harass him, shoving him and splashing water. The “passionate” support of the Reform rabbi happened. It was mentioned in an article about the meeting of the ECAJ. I’d suggest such a view and display of passion has bigger ramifications for the reform movement and the opinion of many Jews than a Zablo that was screwed up and set aside by a NSW court. We should have had a transcript of what she had said. As Rabbis Ullman and Moshe Gutnick noted in their letters to the Australian Jewish News, the focus on positive work and outcomes of Orthodox Rabbis seems to occupy no space in the AJN. I wonder how the left-wing, and Limmud Oz supporters would react if it was suggested that they invite the following Neturei Karta people to speak about why we should be appeasing Ahmadinajad and dismantle the State in favour of Palestinian Arabs. After all, it’s all about tolerance, diversity and giving everyone a fair go to express their views? No, Limmud Oz wouldn’t ever invite Neturei Karta, even remotely by video conference. Why not? I wonder if the AJDS would support them being invited? I imagine they would. After all, democracy is their religion. And yet, Limmud Oz invited Slezak! I don’t see much difference. In retrospect, there is a significant difference. Slezak is taken more seriously, especially by the young and green, and the young and green are mainly behind Limmud Oz. People like Jeremy Stowe-Lindner, principal of Bialik College in Melbourne, writing in an article in the Australian Jewish News that amounts to a whitewash of a serious error by Limmud Oz in inviting Slezak, should now support Neturei Karta using his own arguments. Would Stowe-Lindner also use an error of inviting Neturei Karta to promote his agenda of sidelining denominational issues to the category of personally baked pareve cheese cake? I know of recent cases where the Victorian Rabbinate, through the Beth Din, have solved very serious and long running cases of recalcitrant husbands not giving a Get. Was that a front page story? Heck, no. It’s also the Rabbinate’s fault. They need a PR person in this day and age. In addition, they should have supplied statistics about the number of mediations they have overseen over the last few years which have been successful and not been challenged and compare those with secular mediations and arbitrations that have been challenged. No, you won’t see any of this in our Australian Jewish News. They are in the business of selling papers, and horror stories especially about Orthodoxy are better. Recently, I learned of the tragic petirah of HaRav Menachem Froman. He was well-known in the press over many years. Ironically, a founder of Gush Emunim, and described with the pejorative title of “settler”, Rav Froman was the driving force behind the city of Tekoa. Rav Froman was a thinker, who worked outside the box. He had his own controversial views on how to relate to the Palestinian Arabs (and even known terrorists ימח שמם וזכרם) and many if not most like-minded souls who also moved, with מסירות נפש to far-flung corners of our Holy land, disagreed with his approach. “My premise is that for Jews to live in all of Eretz Yisrael, they have to create a network of life with the Arabs”, says Rav Froman. “In the Holy Land, you can’t make peace without attending to the issue of holiness”. Rav Froman truly believed that conciliation and peace lay only through the spreading of Kedusha through faith-based meetings and respect for adherents of Islam. If I’m not mistaken, Tekoa doesn’t have one of those security fences surrounding it. He wanted Tekoa and its residents to feel comfortable with their neighbours. When some Jewish crazies attacked a mosque and set fire, he came to the village and brought replacement texts of the Koran as a gesture of regret and respect. My cousin, Effrat (née Balbin) (that’s how she spells her first name) and her husband Rabbi David Fialkoff are idealists who live in a caravan in Tekoa. The caravan now houses their bevy of children. They are inspiring and selfless people. David is also a big chassid of Rav Steinsaltz and has impeccable midos tovos. On Shabbos, I used to sing Chabad Nigunim especially for David, who participated with Dveykus. In 2006, I had the Zchus to attend their wedding. It was then that I first laid eyes on Rav Froman. He was one of those people whose eyes were alive, and who had this aura surrounding him. You could just feel his presence. He had such a peaceful and happy demeanour. I remember he sporadically began a dance before the Chuppa with my Uncle Hershel Balter. He personified Ahavas Yisroel and a love for others. I tried to talk to him and engage him on some of his views, and he simply wasn’t interested. He undoubtedly felt that I was attempting to cajole him into a controversial discussion. He wasn’t having a bar of it. We were at a wedding, and he probably sensed that I wasn’t really at the level of having a meaningful conversation on the topic. After all, I was from Melbourne, Australia. What business of mine was there in talking to someone who was an inspiration to the entire community of Tekoa. You couldn’t help liking him. If he had worn a Rebbishe Spodik he would have fit the part of a Jew who had this burning attraction to another Yid’s Neshoma Elokis, and who was attracted to them like a magnet. I’m told that Tekoa is in severe grief and mourning. It is very difficult for the to cope with the loss of their inspirational leader. 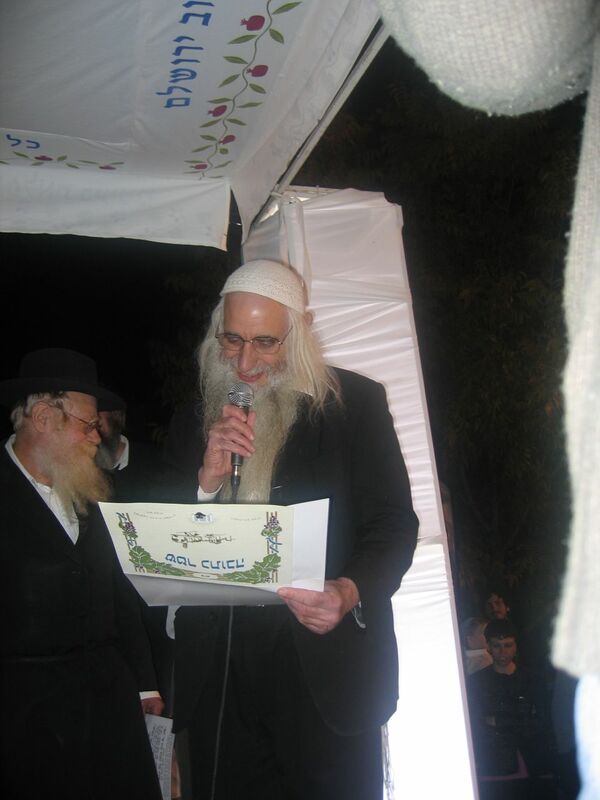 In the picture below, which I took back then, Rav Froman is reading the Kesuba while Rav Shteinsaltz looks on. I liked the man, lots. Rav Froman (on the right) and Rav Steinsaltz on the left. Frum and the not yet frum: Separate or Join? A powerful set of questions are raised in an article titled “Maybe the Secular Are Right?” that was published this winter in the Haredi Kikar Hashabbat, Rabbi Bloch (who is the Head of Nachal Charedi, and a Ram and Rosh Kollel) asks: “Why is it so common for Haredi pundits and public figures to pin the motives for secular hatred against Haredim only on the formers’ bad qualities, their emptiness, anti-Semitism and the ignorant man’s hatred for the scholar? And another question we should ask ourselves is whether, sometimes, the value benefits from this conduct or another are worth the consequent heavy price of hilul Hashem (desecration of the Holy Name). 1. We’ve chosen, for understandable educational reasons, to withdraw and live in exclusively Haredi cities and neighborhoods, avoiding as much as possible any social contact with the secular. This is legitimate and understandable, but as a result they don’t really know us, amd so they naturally view us as bizarre, in our manner of dress, our behavior, and our language. This creates aversion and alienation. Why, then, we are angry at them for treating us this way? 4. We chose for our sons who do not belong, by their personal inclination or learning skills to the group of Torah scholars (Yeshiva bums and worse), to also evade enlistment—including into perfectly kosher army units. And when it comes to the individuals who have joined the Haredi Nahal, we do not praise them, but despise them instead, and we certainly show them no gratitude, while the Haredi press ignores them—in the best case. Why, then, are we outraged when the secular don’t believe our argument, that the purpose of keeping yeshiva students from enlisting, is to maintain Torah study and not simply the Haredim’s unwillingness to bear the burden? 5. We chose to teach our children not to work for a living, and to devote all their time to Torah study. Clear enough, but, then, why are we shocked when the secular—who do not consider Torah study an all encompassing value—feel that we are an economic burden on their necks, as a mere 38% of us take part in the labor force, and they hate us for it. 6. We chose not to teach our children any labor skills, and we condemn those who do pursue a profession. As a result our kolelim include all of those who do not belong among the scholars and still prefer not to work for a living. Why, then, do we complain when the secular feel, and say so with an increasing volume, that we are parasites, living off of their efforts? 7. We chose (for educational considerations?) not to educate our children to show gratitude to the soldiers who risked their lives and were killed or injured for our sake, too. So we do not mention them in any way by any special day or prayer or special Mishna learning that’s dedicated to their memory. Moreover, not a single Mashgiach or Rosh Yeshiva ever talks about it in a Mussar Schmooze, and you’ll find no mention of it in the Haredi press. Why, then, are we surprised that the secular feel that we are ungrateful and despicable, and that the reason for our not enlisting is simply because we are parasites, living off the sacrifices of others in society? 8. When extremist, delusional groups behave in ways that besmirch the name of God—e.g. the spitting in Beit Shemesh, dancing during the memorial siren, burning the national flag—our rabbis chose not to condemn them, clearly and consistently ( except for a few faint statements here and there). Why, then, are we explaining away the fact that the secular believe we all support those terrible acts? Why do we insist that their hostility stems from their hatred of the scholars? 9. We’ve opted to allow our public officials and pundits to curse out all the secular all the time. Why, then, when the secular media treat us the same way, are we offended and cry out that they’re persecuting us? 10. The Haredi press will never offer any praise of or express support for secular Israelis who perform good deeds. Why, then, do we jump up and down when we are rewarded equally? And, in fact, while Haredi spokespersons rarely point anything positive about secular society, the secular media often gives positive coverage to Haredi organizations like Yad Sara, Hatzala, Zaka, etc. 11. We would not agree, under any condition, that secular Israelis turn up in our schools to teach our children heresy, and we would have kept them from putting up stands with books of heresy in our areas. Why, then, do we not understand when the secular do not agree that we seduce her children into denying their parents’ heresy? 12. We do not agree—in my view, rightfully so—that secular people move into Haredi neighborhoods. So where do we get the arrogance and audacity to call anti-Semites those secular who don’t agree that Haredim move near their homes, in secular neighborhoods? Author pitputimPosted on March 3, 2013 Categories KiruvTags Charedi Separation, Haredim, Nachal Charedi, Not yet frum Jews, politics, Religion, Secular JewsLeave a comment on Frum and the not yet frum: Separate or Join? There has long been conjecture about this group. Their cholent isn’t; it’s a legume soup (highly recommended if you are constipated). They speak Hungarian (Goyish) in Shule, whereas Poles and Russians speak Yiddish and considered it anathema to speak “Goyish” in Shule. Polacks often sneeringly (in jest) deride Hungarians. They drink this poisonous harsh on the palate drink called Slivovitz (which is now being considered as injurious to health as DDT) etc. In response, once often hears that the person isn’t really Hungarian but they are Czhecoslovakian or born on the “border”. One startling fact, however, is that of the non Czech style Hungarians, the percentage of Cohanim is lower than among any other group. There have been many theories about this phenomenon. One that has gained traction over the years is that the Hungarian Jews are descended from the Khazars (Khuzarim) who converted to Judaism, as mentioned by R’ Yehuda HaLevi in his Sefer HaCuzari. Back to the issue of Hungarian Jews, another intriguing addition to the jigsaw puzzle appeared in Yediot, which I produce below. Jews of European origin are a mix of ancestries, with many hailing from tribes in the Caucasus who converted to Judaism and created an empire that lasted half a millennium, according to a gene study. I agree mostly with the article, although, I reject the notion that it is about Kabbalists per se. They are but one category of people in a position of power/influence/mystique some of whom may be taken in by the God given gift and basically go off the Derech. Almost each time I am in Israel I go to a Mekubal (and no, please don’t ask me who, as he is not interested in seeing more people and keeps very much to himself) who frankly scares me out of my wits. He can literally “see” things in the future. He doesn’t ask for money. He sleeps on the floor and fasts. He works a Bank Clerk, if you can believe it. He has impeccable lineage from a Kabbalistic perspective, being a direct descendants of the Akeidas Yitzchak (R’ Yitzchak Arama). I don’t like to ask him too much, as I am by nature and training a rationalist and try to deal with life as it unfolds. On the occasions where I have succumbed, and especially when my dear wife has “instructed” me to call him, he has been scarily accurate. Jerusalem – There is nothing more embarrassing than revered rabbis and kabbalists being suspected of stealing Torah scrolls or bribing police officers. No amount of water can extinguish a fire that rages in God’s vineyard. What will naive, God-fearing Jews say when they see corrupt rabbis striving to retain their positions as leaders of communities, and when the homes of the grandchildren of the righteous become their prisons? One of the greatest kabbalists of the past generations lived in the Shabazi neighborhood in Tel Aviv for decades. He was known as the “holy cobbler,” and he lived in a small apartment beside his shop. Each night, pious sages would gather there to learn, pray and offer formulas of “tikkun olam” meant to repair a fractured world. They were all poor Jews who supported themselves through menial labor. Each of them had a nickname that reflected his profession — the cobbler, the builder, the painter, the milkman and the street cleaner. They did not have titles of honor and their yards were always filled with hungry cats rather than important businessmen. During those years, Rabbi Mordechai Sharabi, of blessed memory, lived in Jerusalem. Sharabi, a great kabbalist and founder of Yeshivat Nahar Shalom, a yeshiva for the study of kabbalah in the neighborhood of Nachlaot, was visited by many students eager to learn the secrets of Jewish mysticism. Hundreds paid him a visit each night, and the rabbi patiently blessed each of them. Every cent of the charity donations he received was transferred immediately to the needy, while he himself never took interest in monetary gain. Most of his life was spent in affliction, shunning worldly materials. He viewed the world as a narrow passageway to the world of the afterlife. Years passed and the ever-growing material world took its toll on rabbis studying and teaching kabbalah, the holy crown of Jewish wisdom. Materialism began to affect rabbis who were viewed as role models — rabbis who were supposed to be modest, humble and devoid of material desires. Jewish mysticism, which transcends the mundane world, was gradually taken over by a few characters who proceeded to transform it into nothing more than a lucrative business venture. Those people purchased palaces, luxury cars and other envy-inspiring items with the money they obtained. A genuine sage told me years ago that a kabbalist has never emerged from a five-room apartment. The unholy alliance between the tycoons looking for something to help them deal with their consciences, rabbis under the influence of material desire and media agents who constantly chase the ratings, created a difficult reality that tarred the image of religious Judaism and the kabbalah. God, as we know, is upright and loathes corruption, even when it is done in the name of heaven. The common response to the charges of corruption is that it was perpetrated by rabbinical aides, without the knowledge of the rabbi himself. But if a rabbi is unaware of what his aides are doing right under his nose, how can he know what is being done by Jews who seek his advice? Everyone has the right to approach his trusted rabbi and donate money to him, even if the money constitutes the person’s entire life savings or his or her accumulated pension funds. But the line is crossed when the act involves a desecration of God’s name, something for which there can never be any restitution. It is important for rabbis, kabbalists and public servants to internalize the significance of being a personal example. It is unfortunate that the splendid image of Judaism is being held captive by a few unholy people who exploit the heritage of our forefathers and abuse their special God-given abilities.